Gazelle skin with gilding, the writing in brown ink (sepia). 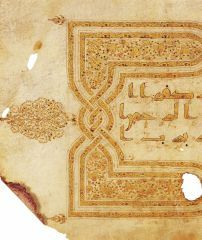 This Qur'an was written in gilt kufic script outlined in brown ink (sepia) on gazelle skin. The verses on the page shown (112: 3– 113: 1) are set in a richly illuminated frame, also gilded and outlined in brown ink. There are no diacritical marks. Vowel marks are shown as red or black dots. The beginning of a new chapter (sura) is only indicated by the basmala (the formula: 'In the Name of God, the Compassionate, the Merciful'). Three diagonal lines are placed at the end of the verses. The Qur'an page is framed by a wide border delineated by narrow bands. The rectangles formed by the border bands form joining sections. The large spaces within these rectangles are filled with decoration including spiralling tendrils with leaves and flowers. 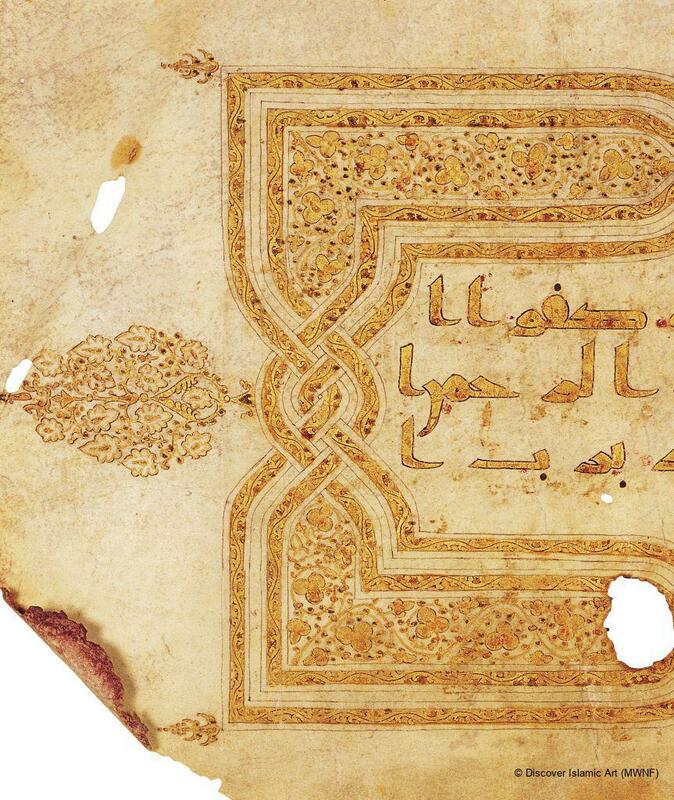 Only five leaves remain to us from this Qur'an, which was made in the AH 3rd–4th / AD 9th–10th centuries in or . Written in kufic script, gilded and richly illuminated, it must have been made for an important mosque or ruler. 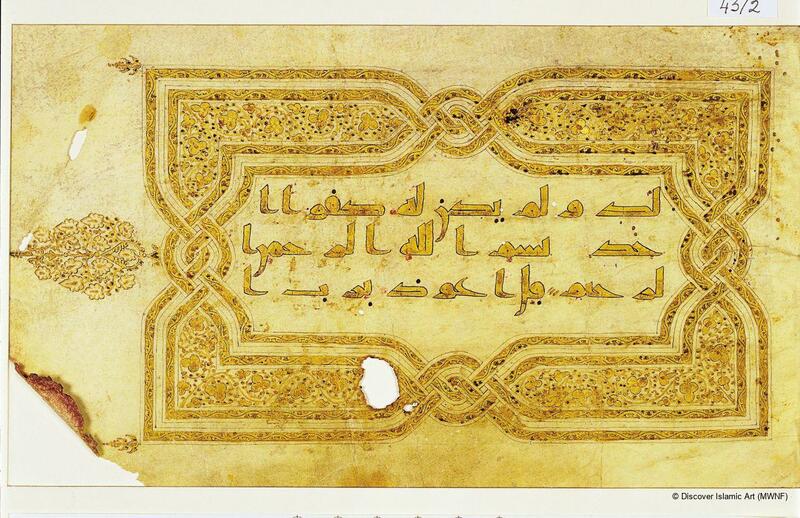 Calligraphy developed as a result of careful copying of the Holy Qur'an in order to make it accessible to the masses. This page is written in kufic script, named after the calligraphic centre in the city of Kufa, and its character is plain and rigid yet striking. The style of writing, the lack of diacritic marks, and the designs used in the illumination all suggest a date of the 3rd–4th / AD 9th–10th centuries. Ismet Bey, the mayor of Istanbul and a member of the board of directors of the Museum of Islamic Foundations (the old name for the Museum of Turkish and Islamic Arts), visited the Umayyad Mosque in Damascus while travelling. 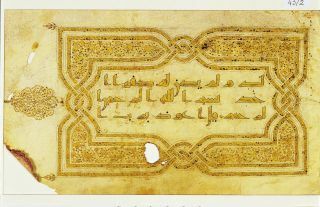 He had a number of items in the collection at Qubbat al-Hazine (Treasury) of the mosque, including this Qur'an, transferred to the Museum where they were registered in the inventory in around 1332 / 1914. The Abbasid Empire was centred in Baghdad, and one of its most important regions was Syria. For this reason the object is thought to have been produced either in Iraq or in Syria. ölçer, N. et al, In Pursuit of Excellence: Works of Art from the Museum of Turkish and Islamic Arts, Istanbul, 1993, p.15. ölçer, N. et al, Museum of Turkish and Islamic Art, Istanbul, 2002, pp.44–5.